The final frontier is finally here. The last bastion of big league boys cross country... that's right the opening of the 3A boys pre-season boys. No one knows how the season is going to shape up in the end, but the beginning may have some merit if the following teams can get out of the gate in good standing. Outlook: After several years of rebuilding, we may be seeing signs of the program shifting into a threat on the big league. Although the competing distance in cross country is three-miles, the Indians laud themselves as prominent on the track. They produced four sub-4:40 milers. Now can they transfer that on the grass? It does help that last year's top runner Julian Higueros has returned with a renewed spirit after sitting out the track season. Higueros missed out on a state berth last fall at sectionals by a spot. He will be poised to run faster than his personal best 15:13 and drag a few teammates with him. The goal is to get to the starting line of the state championship on November 2. Four years has been much too long for the Indians. We still have a lot of work to do, but I'm really excited about the potential of this group. We have a pretty young team with a strong core of sophomores and juniors who are coming off a solid spring. Senior AJ Fundator has been a tremendous leader for us all summer, both in training and as captain. We had a trio of freshmen last year in Aaron Hou, Andy Niser and Michael Sommese who stepped up big time on the track going 4:40, 4:44 and 4:46, while Sommese, and Niser especially, also broke out in the 3200 with a 10:17 and 10:20. They are chomping at the bit to see what they can do this fall. We also return a strong group of rising juniors who got some really good experience in big races last year. Ryan DeSantis and Ian Bacon have really developed as racers and are finding their confidence. DeSantis made a big impact for us answering the call all spring. Anthony Maida and Baito Sarkiss (who was a rookie-sophomore last year) have also really started to close the gap and have provided a spark that we need. Maida broke out in the 3200 this spring running 10:06. Our main focus this year, as it is every year, is to just continue focusing on the process. Fitness wise I believe we are where we need to be at this time of the year and will continue to progress. The difference maker will be how this team responds to the challenge and improves in some of the non-training areas that have hampered us a bit the last couple years. If they do that, which I believe they can, these guys have the potential to leave their own mark on this program in a pretty special way. Carson's outlook: Lyons Township is not looking the greatest this season. 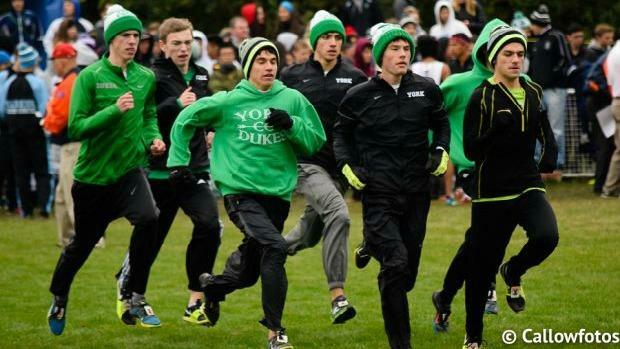 They lost two great runners in Danny Kilrea and Charles Harders to graduation and have left their team with only three returning state qualifiers from last season. If the Lions have shown us one thing in the past couple years, it is that we cannot count them out because every time they don't look that hot they put together a great team and again turn into a threat. Watch the 1-5 split for the Lions to be around 55 seconds. The youngins Sawyer Madell, Owen Hays, and Jocqael Thorpe must be key contributors if Lions has a successful year. Coach Gummerson's outlook: This is a group that has a ton of potential to be an excellent cross-country team. Last year, we came up a bit short of qualifying out of the Granite City Sectional; however, I know that tough experience has had a positive impact on this group. Jason Hoffman and Jordan Freese were on the all-state 4 X 800 team, and that has done nothing but improve their confidence that they can run well on the biggest stage. While success in the spring coupled with a great summer is not guaranteed for success in the fall, it sure does help. I am looking forward to watching this team compete. Coach Kern's outlook: We have one athlete who has broken 10:00 for 3200 and have a long way to go before we can challenge the top teams in Illinois. On the first day of summer cross country, I told our team that we do not have experience or talent, so the only thing we can do is run, run, run. We have been focusing on attitude and effort and trust in the process. We may not end up ranking very high, but these scrappy kids are learning the value of work and that will prepare them for the life that is waiting for them. Individually, Daniel Klysh and Ethan Kern will be our leaders on the course and serve as our captains. They both dealt with stress fractures during their sophomore year and are looking to become relevant on a state level. We are in search of athletes who can fill out a top 7. We will need the rest of the summer and all fall to be ready for the championship part of our season. Coach's thoughts on the team: Our team experienced a lot of success last season. This year's team returns five individuals from last season's top 7 and looks to build off of that success. Our group has solid leadership and experience that starts with the trio of runners Ian Geisler, Jadon Conroy, and Jeremy Roe. These three will put our squad in the position to be successful at every meet. Chris Simek is coming off a great junior year and definitely will be impacting the top five. There are a handful of boys who have the potential to be in our top 7. I expect individuals such as Shaaf Iqbal, Jimmy Ozzauto, Dylan Nicosia, and Brice Klepfer to have an impact throughout the season at the varsity level. We had a great spring track season and I expect other kids to be competing for the top 7 spots by the end of the season. So far this summer we've had our whole group together and everyone is healthy which is always a recipe for success. This group has the potential to do great things this upcoming season if we are able to stay healthy and focused on our goals for the end of the season.